Broadway composer Stephen Sondheim could not have been more succinct when he wrote a lyric for his groundbreaking 1970 musical, Company. It was a mere six words, but when performed by iconic actress Elaine Stritch, “Does anyone still wear a hat?” became as much a part of the very fabric of musical theater (ironically spoken, not sung) as Bette Davis’s “Fasten your seatbelts, it’s going to be a bumpy night” did for film. Truthfully, almost a decade earlier, the hat as a must-have for any well-dressed lady’s daytime turnout was single-handedly eradicated by one man: hairdresser Kenneth Battelle and his bouffant hairdo for First Lady Jacqueline Kennedy. In a broad stroke, with the help of large Lucite rollers, a lot of back combing, and a monsoon of hairspray, the American women’s millinery industry went belly up. Similarly, when President Kennedy eschewed the traditional top hat at his inauguration, the same fate befell the men’s hat business. It was considered a novelty therefore, when in 1983, the Women’s Committee of the Central Park Conservancy planned a new fundraising luncheon at Tavern on the Green and encouraged ladies to wear pretty spring hats. Three hundred guests attended and the event raised a grand total of $173,000. Today, the annual Frederick Law Olmsted Awards Luncheon attracts a sellout crowd of 1,200, and over its 36-year history has raised over $55 million dollars for Central Park (this year’s event will be held May 2). It is one of the most successful fundraising luncheons in the country, along with being one of the most photogenic. 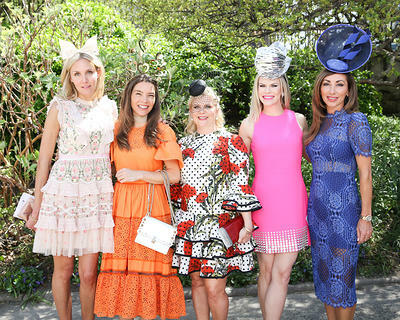 Spectacular hats and stylish dresses aside, the Central Park Hat Luncheon, as it is universally called, is now held in a soaring tent erected within the Conservatory Garden, the only formal garden that exists in the park. Covering a total of six acres, it is divided into three styles: English, French, and Italian. Like so much of Central Park, the Conservatory Garden was severely neglected before the Conservancy was formed as a private, non-profit organization in 1980 by a small group of concerned citizens. Restoration began in 1983, and in 1987 it was reopened to the public. Like any garden, it requires constant care, albeit on a grand scale. Equally sensational without fail are the attendees, as captured over the years by renowned photographer Mary Hilliard and the late photojournalist Bill Cunningham in his feature pages for the New York Times. A milliner before he went to work as a freelance writer for Women’s Wear Daily, he had a falling out with publisher John Fairchild and resigned, reinventing himself as a photographer of society and street fashion the likes of which the world will probably never see again. Here are a few more photos from the luncheon in years past.